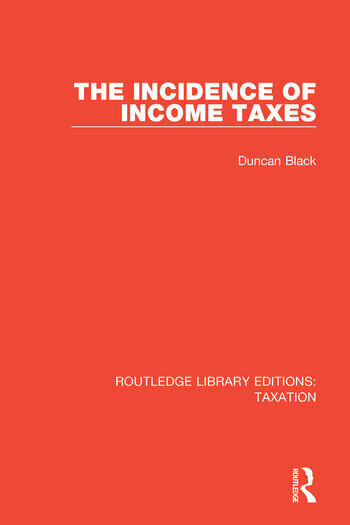 In this book, first published in 1939, an analysis is given of the incidence both of partial income taxes, that is of income taxes which are levied on the incomes arising from particular lines of industry, and of a general income tax. Part 1. The Older Theory of the Incidence of a General Income Tax 1. Introduction 2. The Three Arguments of the Older Theory 3. Mr. Coates’s Theory and Statistical Investigation 4. Two Main Sources of an Improved Doctrine: The Colwyn Report and De Viti De Marco’s First Principles Part 2. The Incidence of Partial Income Taxes 5. A Tax on the Income of a Monopolist 6. The Incidence of a Proportional Income Tax on the Diamond Monopoly in South Africa 7. The Incidence of a Partial Income Tax 8. The Incidence of a Proportional Income Tax and of the Present Income Tax on South African Gold Mining Part 3. The Incidence of a General Income Tax 9. The Conditions Assumed and the Method to be Followed 10. On the Disregard of the Expenditure of the Tax Proceeds in the Theory of Incidence 11. The Effect of the Income Tax in Direct Alteration of Demand Schedules 12. The Effect of the Income Tax on the Supply of Labour Per Individual 13. The Effect of the Income Tax in Changing the Size of Population in Short Periods and in the Long Period 14. The Effect of the Income Tax on the Quantity of Capital in the Short and in the Long Period 15. Conclusions. The Incidence of a General Income Tax in a Stationary Community 16. Conclusions cont. The Incidence of a General Income Tax in a Progressive Community 17. The Effect of the Income Tax on Uncertainty-Bearing 18. The British Income Tax: How Should We Alter It?